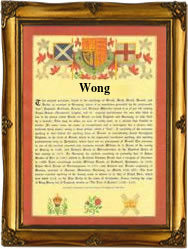 Recorded as Won, Wone, Wong, Woon and possibly others, this surname which appears to be from the Far East and particularly associated with China, but in England, is usually English. It has at least two origins. It has been recorded in England since at least the Stuart period and possibly much earlier with as an example Thomas Wong recorded as marrying Sarah Newman at the famous church of St Martins in the Field, Westminster, on December 14th 1699. It is very unlikely that this man was Chinese or even of Far Eastern origins at all, and it is much more likely that the spelling developed from the pre 7th century Olde English word 'geong' meaning 'young,' and a baptismal name of endearment for the youngest child in a family. This is recorded as the surnames Ong or Yong, but its most popular spelling is in fact as Young. Alternatively if Chinese the name is a variation of Yang, and means the dweller by a field or meadow. The surname is not recorded again at least in the city of London although we understand it is in other regions, until the 20th century.